Brett Whaley (right) with the Hinchingbrooke Cup he won in a previous spell with Yaxley. The worst-kept secret in non-league football is out as Yaxley FC have today (April 4) confirmed the re-appointment of Brett Whaley as first-team manager. Whaley’s return to In2itive Park was seen as inevitable once he quit his managerial post at Wisbech Town on the same day (March 31) as Yaxley parted company with their manager Ian Benjamin. Bourne manager Steve Wilson (right) with a United Counties Division One manager of the month award. Whaley surprised many United Counties Premier Division followers when he left Yaxley for Wisbech last summer. Andy Furnell, who managed Yaxley in their 2-2 draw with Deeping Rangers on Saturday (April 2), will work as Whaley’s assistant. Yaxley president, Jeff Lenton, told the club website: “Brett has made it abundantly clear to the club that he made a big mistake in leaving us to join Wisbech Town. At a meeting of committee members and sponsors, Brett was seriously grilled for more than 90 minutes and to his credit gave an good account of himself, historical events and future ambitions. If he hadn’t he wouldn’t be back. Andy Furnell is very happy to work with Brett and it’s a partnership that we as a club are confident has a good chance of success. Action from Bourne's (red) 3-0 win over Bugbrooke St Michaels over the weekend. Photo: Tim Wilson. Whaley starts his second stint in charge of ‘The Cuckoos’ with a Premier Division game at Northampton Spencer tomorrow (April 5), who are one place above Yaxley in 12th. 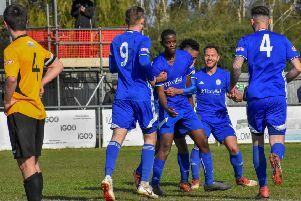 Holbeach United’s title challenge in the Premier Division has died, partly because of the sheer weight of their playing schedule, but they could still affect the destination of the trophy as tomorrow they travel to second-placed AFC Kempston Rovers. Mazarella has moved quickly to bring successful Bourne Town manager Steve Wilson to Chestnut Avenue as his number two, although Wilson will stay at the Abbey Lawns until the end of the season. Wilson has been a huge success at Bourne, steering them to fifth in Division One of the United Counties League. He runs his own business though and can only commit to being a number two next season. Wilson worked under Mazarella at Bourne earlier this season. And March Town United Reserves tackle Wisbech St Mary in a repeat of last season’s North Cambs Junior Cup Final at Wisbech Town FC (7.30pm). Wisbech St Mary are the holders. (7.30pm): March Town United Reserves v Wisbech St Mary (Wisbech Town FC).